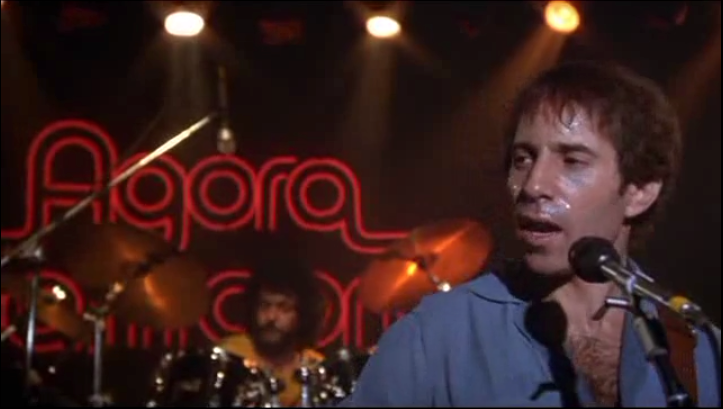 One Trick Pony is a 1980 Paul Simon movie with a soundtrack that doubled as Simon’s Warner Brothers debut. The vehicle is technically a fictional biopic about a successful 1960’s rocker named Jonah Levin (Simon), as he endures the 1980s, a dwindling fan base, tepid record executives, and a marriage on the rocks. It’s part road movie, part record industry commentary, part sweat study, and part Kramer vs Kramer-lite. There is plenty of fodder here that lend itself to pointing out the similarities of Jonah’s journey to Simon’s own career arc, but rather than focus on that, let’s look at two scenes that exemplify how this is the most acutely self-aware movie about pop music, while simultaneously being an out-of-touch vanity project, that ultimately bombed at the box office. The following two clips are a prime example of why these “rock movies,” are so fun to chase down. Here we have the B-52s in their prime, nailing Rock Lobster in small club, followed by a young Lou Reed playing a smarmy record producer riding at the console with Rip Torn and bass legend Tony Levin. Only in the movies. I’m sure this was nothing more than Warner Brothers trying to give a little mainstream love to Simon’s new labelmates, but to write them into a newspaper review as critical darlings while the decrying the Jonah Levin band as uninspired and over the hill is just so incredibly accurate! The idea that Simon (who wrote the film) would add such a scenario into a somewhat bloated vanity film is true irony. Reed and Torn are so good. The irony here is that while Jonah is ultimately crestfallen with the results of this session, this is exactly the type of song that the real Paul Simon would record, in fact there is a soundtrack full of these types of songs. It’s called One Trick Pony. The gem of said soundtrack is below. Posted in Uncategorized and tagged 1980, jonah levin, late in the evening, lou reed, One Trick Pony, OST, paul simon, rip torn, Rock Lobster, soundtrack, the agora, the B-52s, tony levin on December 6, 2015 by mgroesch2014.